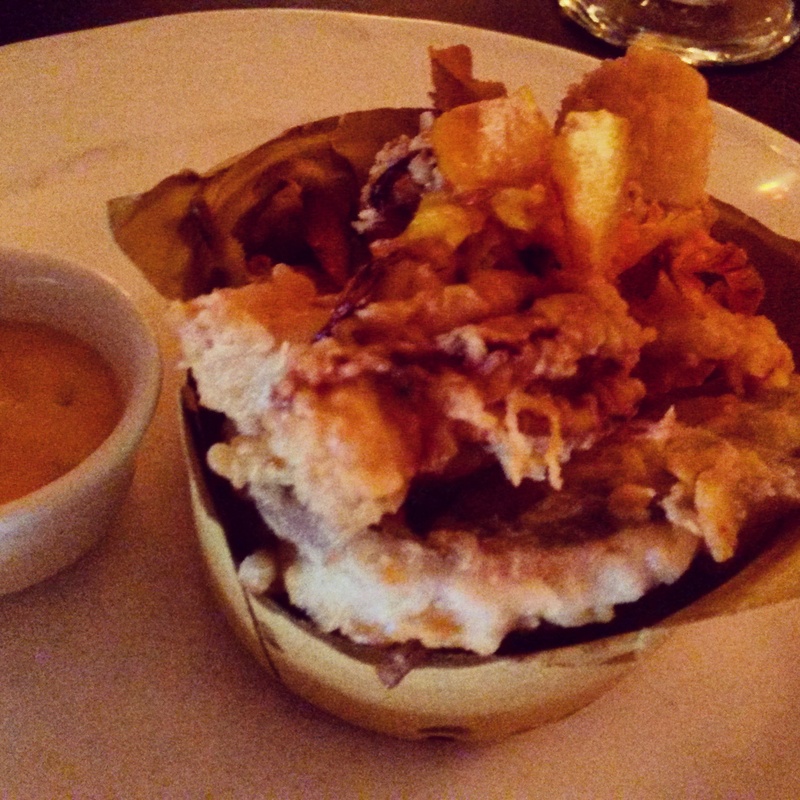 Our trip to Gusto was yet another occasion where I was wishing I had a proper camera and not just my phone! I’m sad to say my pictures do not these delicious dishes justice, thus I will just have to be as descriptive as possible. 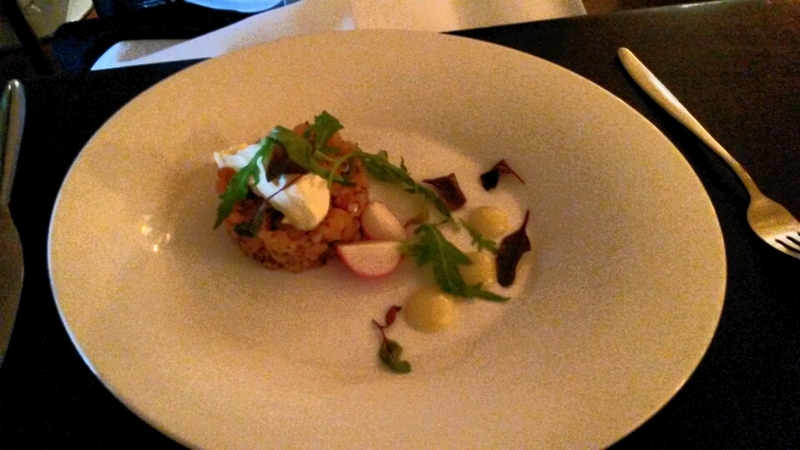 Having attended the Perrier-Jouet tasting dinner at Gusto on George Street in Edinburgh, when I was asked to review the new menu, it was an easy yes. Gusto is a chain of Italian inspired restaurants you can find in many of the big cities up and down the country. To be specific, the restaurants are “inspired by the traditional grand cafes of Europe, Gusto is all about making the everyday exquisite.” It’s suppose to be ‘everyday decadence’… that’s something I can get on board with. Edinburgh’s Gusto is located at the Charlotte Square end of George Street. The set up downstairs is a mix of round booths and high bar stool tables. We were taken upstairs to the mezzanine level and sat at a table overlooking the restaurant – a great spot for watching everyone coming and going, for there is a lot of that with it being a fairly large dining space. Our waiter, very friendly and polite, was straight over with the wine list and menus. Being mid-flat move, Mr. F&P was on the sparkling water as unfortunately we had chores to complete that evening, however I opted for a glass of Novita Trebbiano, correctly described as ‘wonderfully easy drinking’. I love when waiters or waitresses recommend dishes from the menu, so when I ordered the calamari and our waiter suggested the Fritto Misto instead, it was a no brainer to change my order. What was thinking just going for calamari when I could have with sardine, prawn, calamari, and courgette as well?! I made the right decision. 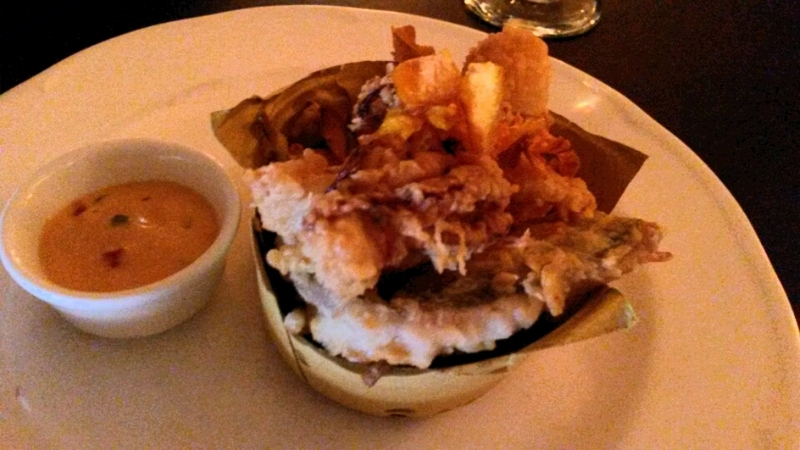 The batter was so incredibly light and nicely peppered, and spiced tomato mayonnaise reminded me of a dip that is served at The Outback in America when you order their famous ‘Bloomin’ Onion’. 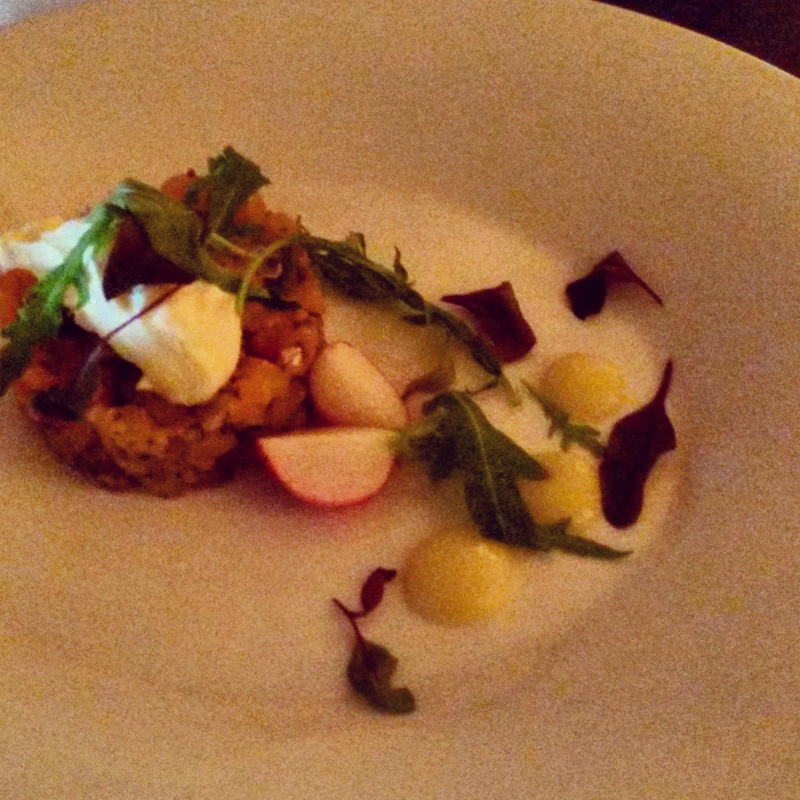 A joy of a dish to start the evening off. 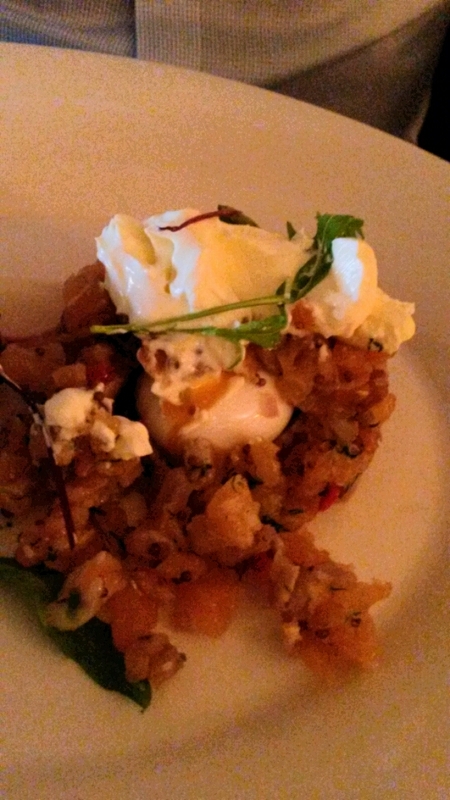 Mr F&P tucked into salmon tartare which was served with a soft boiled quails egg (inside the salmon tower – a fun touch) and some crème fraîche and red gazpacho. Another delicious, and very pretty looking, plate of food. 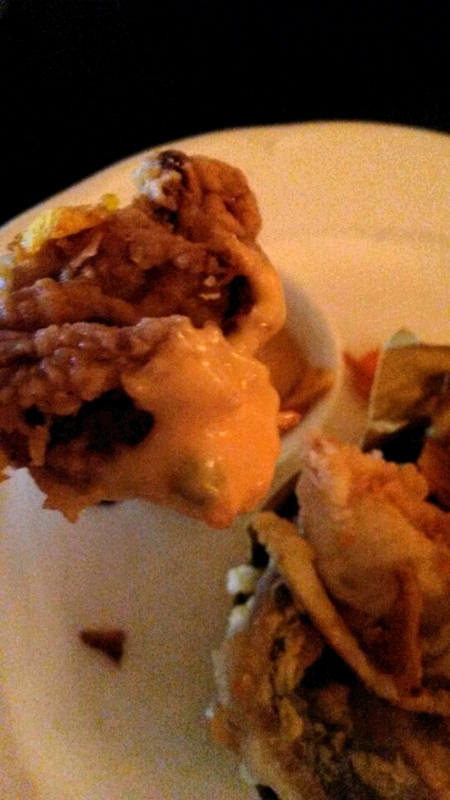 And that’s the quails egg, right there in the middle. 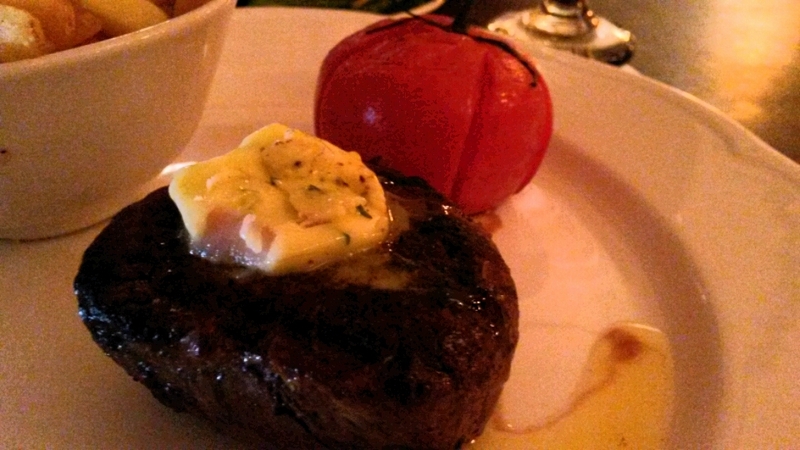 For my main I ordered the 6oz chargrilled fillet steak, medium, which came with garlic butter, roasted vine tomatoes and fries. 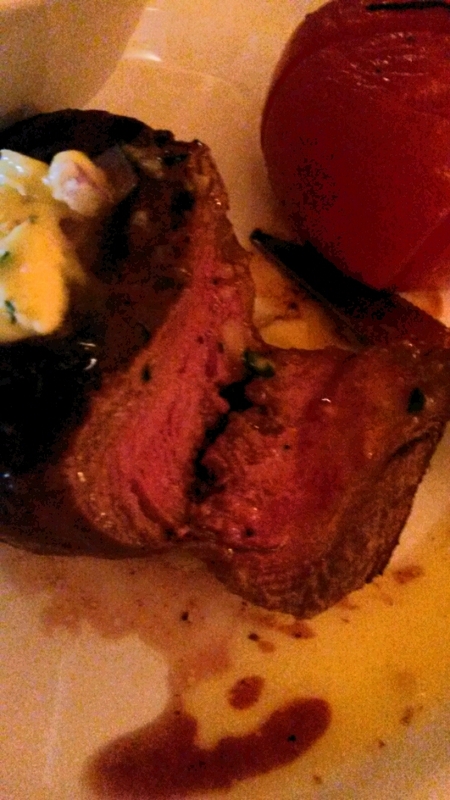 The steak was cooked exactly to my liking. What can you say about garlic butter, other than it’s totally delicious, by far by steak sauce of choice. I’m not convinced the chargrilling added much, however certainly it didn’t detract from a very flavoursome, juicy piece of meat. 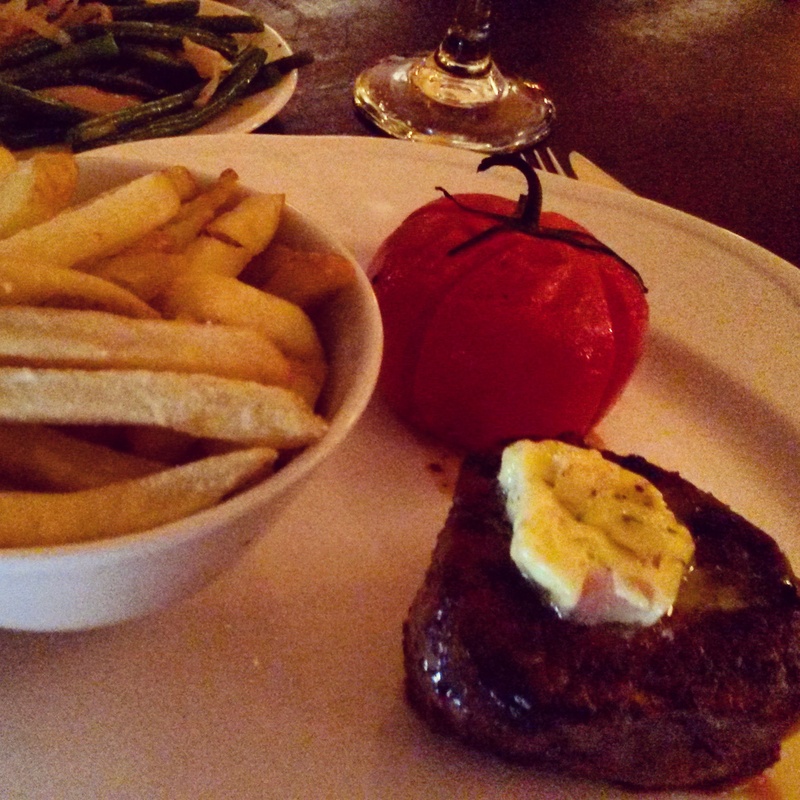 The ‘vine tomatoes’ were just one large vine tomato, but no problem with that, and the fries were lovely and crispy. No need for the dish. 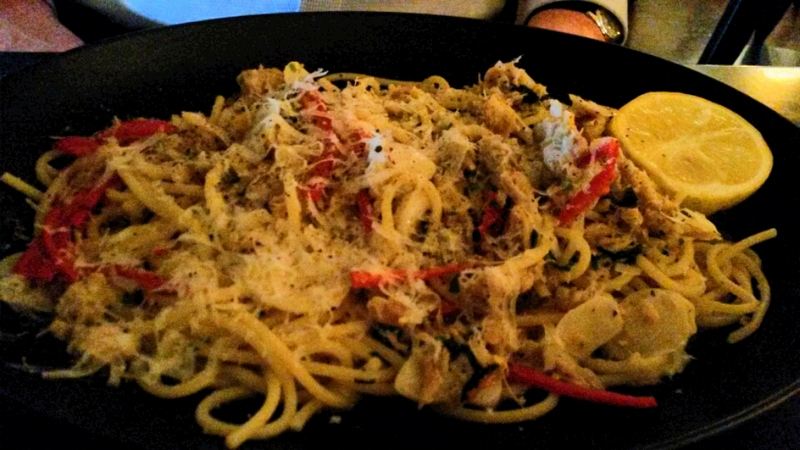 I was less convinced by the pasta dish – white crab, chilli, garlic and fresh lemon spaghetti. Perhaps we eat too much pasta at home and I don’t appreciate it as much when I go out. I also find it fairly easy to make a damn good pasta dish at home, thus when I go out I really expect to be wowed. That said, the spaghetti was fresh, the lemon sauce coated the spaghetti well, not too much, not too little. Just not a patch on my steak, but perhaps I am trying to compare apples and pears. A little break as we surveyed the dessert menu. 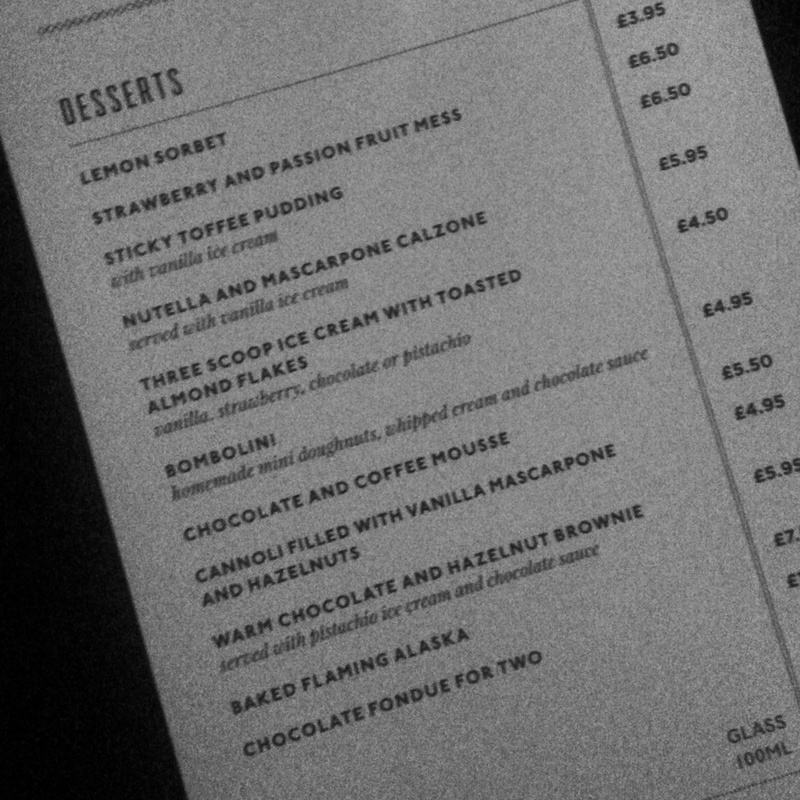 This is where I struggled… I am fairly confident I would have enjoyed absolutely every dessert listed. This is a dessert menu for chocolate lovers. 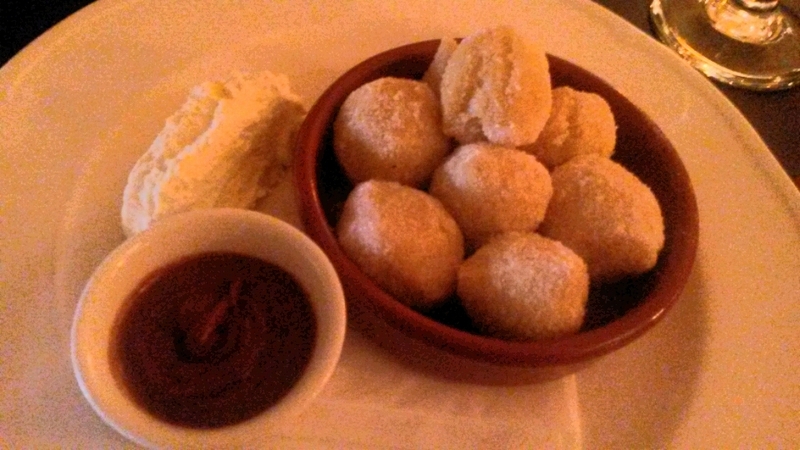 I was torn between the nutella and mascarpone calzone and the ‘bombolini’; homemade mini doughnuts with whipped cream and chocolate sauce. Thinking I may not have room for something that called itself a ‘calzone’ I chose the mini doughnuts and was rewarded with a really simple, but yummy, dessert. Bizarrely light for pudding of doughnuts, the chocolate sauce had an edge to it which I’m putting down to some sort of liqueur. Again, too many dishes on the plate for my liking, or perhaps a different shape of under plate would work better. 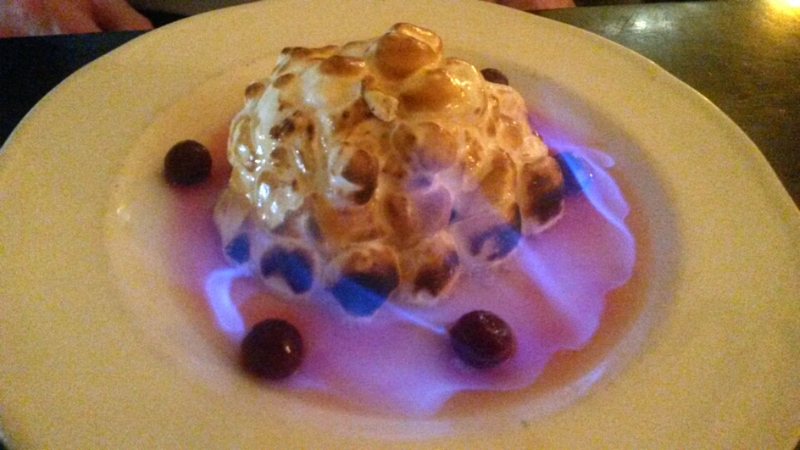 The star menu was the ‘Baked Flaming Alaska’, served and lit at the table, it glowed purple for a good 30-40 seconds. As you might have guessed by the quails egg inside the salmon tower, I’m fairly easy amused and I thoroughly enjoyed the dramatics. With the departure of The Living Room from George Street, Gusto will be a good staple haunt for large groups – plenty space and something for everyone on the menu. What I liked most about Gusto is that it did not feel too much like a chain. I’ve yet to visit the one newly opened in Glasgow, but my overall feeling is they take on the character of the buildings they live in, hopefully making each one a tiny bit different. Make a trip, I promise your dishes will be look more spectacular than the ones captured in this post, and I hope they are just as tasty. 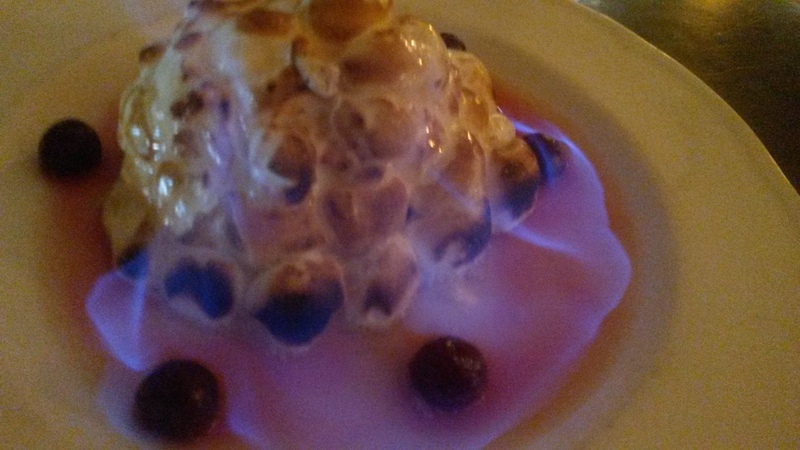 For now I’ll weigh up the cost of a new camera and think some more about baked Alaska.